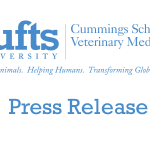 Faculty clinicians at the Hospital for Large Animals at Tufts University’s Cummings School of Veterinary Medicine report that a three-day-old reticulated giraffe in their care is in stable condition at the hospital’s neonatal unit. Born at Southwick’s Zoo in nearby Mendon, MA, the female giraffe, named Molly, was brought to the Cummings School after her mother did not produce milk. Veterinarians at the zoo were concerned that the calf did not receive vital antibodies from her mother’s colostrum, the first milk that prepares newborns for growth, proper functioning of organs, and immunity from disease. Representatives from the zoo provided her with cow colostrum—a common substitute for large animals who do not receive mothers’ milk—then brought her to the Cummings School’s Hospital for Large Animals for her neonatal care. Today, the giraffe is doing quite well, said Dr. Daniela Bedenice, an assistant professor of Clinical Sciences at the school and the camelid expert in charge of the giraffe’s care. Our students report that she’s been nursing well, and although she still has a potential for infection, she’s improved over the past day tremendously. Dr. Bedenice reported that the giraffe is being provided with intravenous fluids and glucose, as well as around-the-clock care. The calf weighs 86 pounds and stands more than 5 feet tall at three days old. Her mother, Mauzy, is doing quite well. Southwick’s Zoo is currently closed for the season and will open full-time on April 11. Indigenous to Kenya, Ethiopia, and Somalia, reticulated giraffes are known for the spider web-like pattern on their coats. Giraffes are the tallest of all living land-based species. 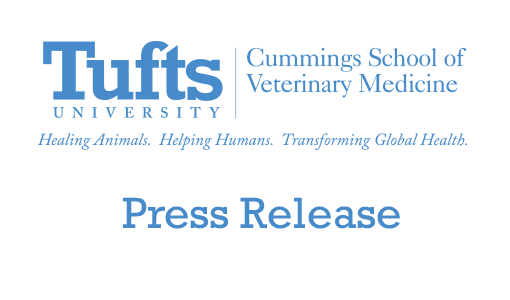 Due to concerns about disease transmission, access to the giraffe has been restricted by the Cummings School of Veterinary Medicine, which treats about 1,900 animals each year—mostly horses and alpacas—at its Hospital for Large Animals.